Reiki helps us to enter into a deep state of relaxation. Through this we enhance our natural ability to heal ourselves. The patterns learned in early life can often keep us locked in tension and fear. This non-invasive therapy requires no belief system. The gentle healing energy of Reiki works happily alongside and complements other forms of therapy and medicinal treatments. People have varied sensations during and after Reiki. Most often it brings us to the rested state usually achieved through sleep or meditation. It is best to hold no particular expectation - sessions can be very different each time, although they will usually induce a calm and rested state. The benefits of energy healing are usually experienced over a wide time frame. Generally I prefer to work from my studio (pictured below) in Shillington, but I am prepared to travel to your home if necessary. Allow at least one hour. Extra time is beneficial for consultation, this is particularly the case for the first appointment. During the years of my own development I have most often turned to Sound to 'make sense' of the confusing bombardment of information we are all party to in these modern times. 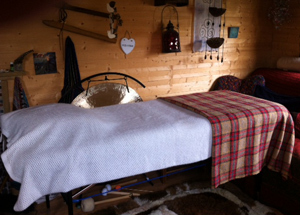 If you would like to experience a Sound bath then this can be incorporated at the end of your Reiki session or be the main focus of your journey. "My body became heavier as soon as the waves of sound began. It was an easy surrender into calm, trust and feelings of love. My mind went first to space – deep nurturing blackness with colours bursting through as triangles pyramids and rainbows. Later there were white orbs with coloured edges and white ethereal beings floating soothingly in the black. I felt deep relaxation and calm. As sounds built to crescendo I noticed tingling waves of bliss moving through my body as though they were transforming every cell. There were visions of beauty - green mountainous landscapes and wide blue seas. Near the end the tinkling of shells brought images of beaches with waves breaking gently on to sand." Ness C.